We had organic vanilla yogurt with Bran Buds and fresh cut strawberries. I'm normally quite skeptical of winter strawberries. We got these on the weekend at Kin's market for 2 for 5$! And they smelled lovely. Though, I am starting to wonder about that smell. I smell it everywhere now on berries. I wonder if berry farmers are spraying an enhanced smell on it like rosewater or something. Too often, they don't smell as nice as they smell. I've heard that some farmers in Florida are spraying their oranges with orange food colouring. Not that there is anything wrong with the oranges or their flavour but marketing-wise, people won't buy green oranges. (well, except in Bali, probably) So I wonder if they're doing that with berries, cuz that is definitely the first thing I do when I pick up a box of strawberries, take a big ol' whif. These were nice a big, though hollow in the middle, which is a sign that they are past their prime. They are most nutritious and tasty when it's a solid centre. They tasted alright but not as good as they smelled. Actually, they didn't smell as nice after washing either. 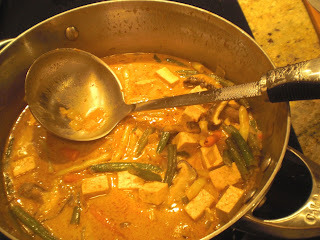 For dinner we made, or I made a coconut curry. I was hoping for green thai but we only had red thai paste. Oh well. I made the curry tonight cuz, 1. I don't like the order that D does it in. He puts the coconut milk it first and I always cringe. 2. D doesn't like the way I do my rice. So we traded. He did the rice. 1. pkg Mae Ploy Red Thai paste. It's enough for 2 people with small seconds and a small lunch. NOTE on Coconut milk, there are some lo-cal varieties out there. I don't recommend them. Read the cans. The coconut content is usually quite low and there are some additional mystery ingredients. A good can will have two or three natural ingredients. I like Thai Princess, consistently very coconutty. I also like this one can with Thai writing on it (I'll take a photo later). It's a black can with a photo of a coconut cut in half. That's the one we used last night. It was great! Normally, the puck of coconut solids at the top of the can is about an inch. You scoop it out add it to what you're making and pour the rest too, swish to get all the goods with a 1/3 can of water. D sometimes will break up the puck and mix up the can with a spoon in the can. This can was like 2/3 or half way solid coconut. mmmmmmmmm I lurrrve coconut curry. It was extra coconutty and thickened the curry more than I thought. D watered it down a bit for seconds. I probably boiled it for a bit too long. Do NOT use Dan-D-Pak Coconut Milk. It is always letting me down. I've used it at least 4-5 times. It is too watery, very little coconut solids and not very coconutty tasting. 1/2 white onion, diced, D just slices, I don't like big pieces of onion. 5 fresh shitake mushrooms brushed, trimmed and sliced. -if stuff starts to stick, add some water, I usually fill the pouch the paste came in with some water to swish. I waste nothing. -turn up heat on high and boil hard for a couple of minutes. Don't let it reduce too much if there were alot of coconut solids, it will continue to thicken. We had gin and tonics tonight since I bought some limes.